Coptic Pope: “Todays Jews are not God’s chosen people” – I Know it's Crazy but…..
“Modern-day Jews are not God’s chosen people, said Pope Shenouda III, the head of Egypt’s Coptic Orthodox Church”. 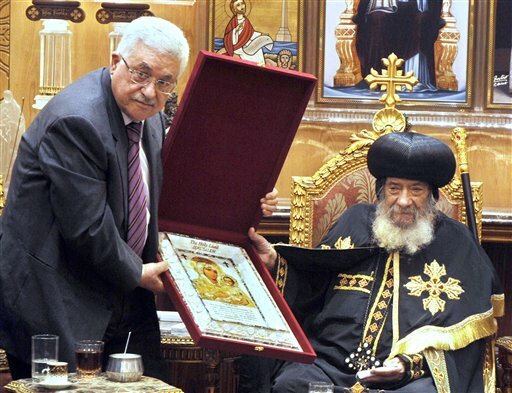 Look at this gift from Mahmoud Abbas to the coptic Pope. An icon of the “Holy Madonna” and her son. Cairo: September 13th, 2011. This is a statement given on Sept. 28th, 2011. “Do not believe their claims that they are God’s chosen people, because it is not true,” Shenouda said during his weekly sermon on Wednesday evening at the papal residence in Abbasseya. When there were no believers on earth the Jews were really God’s chosen people, but God’s chosen people are now all those who believe in the existence of God and carry out all God’s teachings, he added.